TODAY I start my boycott of Saravana Bhavan. It may be invisible to many New Yorkers, but it has been my favorite South Indian restaurant since my first visit five years ago. I knew Saravana Bhavan before its reincarnation as a wannabe lounge, with its white leather sofas and gleaming new bar. I knew and loved the bright orange and hot pink fabric flowers that brightened up its walls, before those flowers began to droop. I’ve stood outside in the cold on Sunday mornings when it’s always packed, waiting for a table for two. And I’m not going to do it anymore. There are some places that seem to glory in their inhospitability. The famous chicken and rice stand midtown, where lines stretch down the block. That neighborhood adda where they’ve seen you a million times before but would die before acknowledging it. And then there’s this place, which takes it to the next level. But at some point, you have to stop making excuses for the place. There is no justification for treating customers like cattle, like you’re doing them a favor by taking their order, not noticing when water glasses need to be refilled or the table you’re waiting on has been waiting on YOU for the past 20 minutes to place their order. I know that the outpost in Curry Hill is part of a sprawling chain that recently opened a new branch on Amsterdam Avenue. Maybe in that establishment they understand courteousness. In this one, they don’t. And it goes all the way up the chain. Today was the first time that I felt the urge to speak to the manager about an unpleasant experience. I’ve seen him around on plenty of occasions. He was there watching the TV screens they had put up during the cricket world cup earlier this year when India beat Sri Lanka. I watched along with everyone else as I waited, unnecessarily, for a good half hour for a large order that was to have been ready for pick-up when I arrived. I went to this person perhaps naively imagining that someone in the restaurant business would not condone such incivility to a paying customer, to (gasp!) a regular. Instead, I was strongly told off for daring to expect that my companion’s meal and my own would arrive at roughly the same time. What did it matter if my meal arrived 20 minutes before my friend’s and was growing icicles in the interim? (This would never happen at even the humblest udipi in my hometown, Mumbai; those restaurants are models of efficiency.) I should have just eaten it, licketysplit. The waiter was under no obligation to inform me that our main courses would not be arriving together when we ordered together or even when he brought me my dish. I would have to eat my dosa cold, and that was that. There are some things that are good when cold. Kulfi, chhaas—even revenge—come to mind. A crispy dosa, not so much. So I took myself and my unreasonable demands out of there. For $7.15 or thereabouts, this South Asian restaurant has lost a loyal customer. 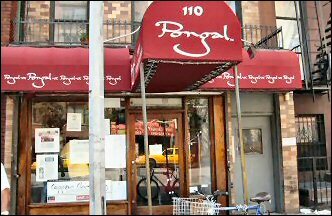 In the future, I will be taking my business to Pongal, across the street. TWO years ago The New York Times published an exhaustive list of rules for restaurant staffers by Bruce Buschel. It was clearly meant for fine dining restaurants, where the ethic is much more than just a quick table turnover. I understand that every eatery cannot and will not adhere to this high standard—though I wish more would try. But here are my picks from this list that cost nothing or very little and will contribute a great deal to guests leaving any restaurant happy. —Do not let anyone enter the restaurant without a warm greeting. —When you ask, “How’s everything?” or “How was the meal?” listen to the answer and fix whatever is not right. —Make sure the glasses are clean. Inspect them before placing them on the table. —Never remove a plate full of food without asking what went wrong. Obviously, something went wrong. —Do not bang into chairs or tables when passing by. —Never patronize a guest who has a complaint or suggestion; listen, take it seriously, address it. I looked carefully for a “Do not yell at guests” point, but I guess some things are so obvious Buschel figured it didn’t need to be said. I, for one, prefer to eat my dosas hot and somewhere else.